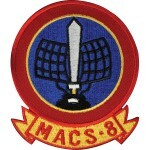 MACS-8 was formed in 1952 at MCAS Miami, Florida and disbanded in June 1971 after the return from the Far East(MCAF Futenma, Okinawa). Most members attending our reunions served with the Squadron during the 1961-1965 tour in New River, North Carolina with cruises to Roosevelt Roads, Puerto Rico by LST. In April 1964, we took a MATS flight to Japan and road transport to our new headquarters at NAS, Atsugi. We were shipped In January 1965 to Camp Schwab, Okinawa, then to the islands northern jungles for training and operational duties. In May 1965, MACS-8 came back to the U.S. with many getting orders at MCAS, El Toro, California or being discharged. During Korea, the USMC had outfits called Ground Controlled Intercept Squadrons. These were the predecessors of all Marine Air Control Squadrons. TIME LINE: EARLY 1958 MOVED FROM OPA- LOCKA TO PARRIS ISLAND, S.C. The tenant military current activity is Coast Guard Air Station Miami, operating HU-25 Guardian jet aircraft, the HC-144 Ocean Sentry turboprop aircraft and HH-65 Dolphin helicopters for coastal patrol and air-sea rescue operations. Much of CGAS Miami’s facilities were originally built during World War II as part of the former Naval Air Station Miami. Sir, I’m sorry but I do not know your friends, but I could use your help. I am former Ssgt AJ Schwankert (Big Bird). I was a controller at MACS-4, MACS-5 and MACS-6 from 1982-1995. I am doing research on the lineage of each of the units, from their inception in 1943 as AWS to present, for the Marine Air Control Squadron Reunion, to which I hope you come, in June of 2017. MACS-8 seems to be one of those mysterious units that few know anything about. If you could call me any evening at 828-320-7118, I would surely appreciate the contact and information. BARRACKS AS ME..SAID IT WAS FALLING APART..ROOF LEAKS ETC. MORE BLOG ROOMS..NOW IAM CHECKING ALL OF THEM ..
Flew as radio operator on the C-47 based at Futenma, 1963. PC was enlisted E-9. GREAT short tour replacement assignment. Returned to VMGR-152 Iwakuni, Japan. I am interested in the last commander of the MCAS in 1959. I was in Junior High School with his son Mike Wertman (I’m not sure of the spelling). He told us his father was an LTC with the Marine Corps and was stationed at Opa-locka. His job was to close the Marine portion of the base. Any information you could give me would be greatly appreciated.